BLACK REPUBLICAN BLOG: HISTORIC: Republicans in House and Senate Pass Tax Cut Bill! HISTORIC: Republicans in House and Senate Pass Tax Cut Bill! 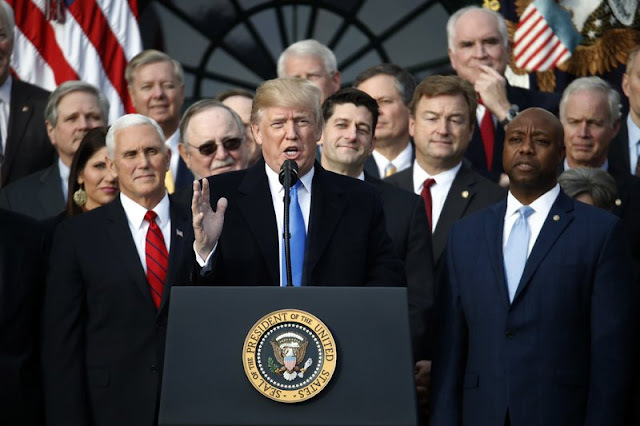 President Trump is praising Republicans for passing historic tax cuts Wednesday afternoon and will host lawmakers at the White House for a celebration. After the House voted and passed a revised Senate version of the legislation, lawmakers who voted in favor congregated outside of the Capitol to board buses down to Pennsylvania Avenue. The bill will be signed by President Trump in the coming days and will go into effect in February. "We had a historic victory for the American people. It will go through final passage today in the House. Then the congressmen and women and the Senate will be coming over -- the Republican Senate," Trump said at the White House earlier today. "We're going to have the Republican senators come over, we're going to have the Republican members of the House come over. And we're going to have a news conference. And people are starting to see how great this historic victory was." Senate Minority Leader Chuck Schumer (D., N.Y.) on Wednesday attacked AT&T by name for not passing along tax savings to its employees immediately after the telecommunications giant announced that it would do just that. AT&T announced Wednesday that it will give $1,000 special bonuses to more than 200,000 "union-represented, non-management and front-line managers" and invest an additional $1 billion in the U.S., citing the House and Senate passage of the sweeping Republican tax reform bill as its reason for doing so. "Congress, working closely with the president, took a monumental step to bring taxes paid by U.S. businesses in line with the rest of the industrialized world," said Randall Stephenson, AT&T chairman and CEO. "This tax reform will drive economic growth and create good-paying jobs. In fact, we will increase our U.S. investment and pay a special bonus to our U.S. employees." "Since 2012, AT&T has invested more in the United States than any other public company," the company added. "Every $1 billion in capital invested in the telecom industry creates about 7,000 jobs for American workers, research shows." Almost simultaneously with the AT&T announcement, Schumer gave a prepared speech attacking the notion of trickle-down economics and arguing that companies receiving tax breaks would just pocket the difference. "I love the example of AT&T," he said. "Over the last ten years, AT&T has paid an average tax rate of eight percent a year. They have 80,000 fewer employees today than they had then." "Tax breaks don't lead to job creation," Schumer continued. "They lead to big CEO salaries and money for the very, very wealthy."